This was a really tough weekend. How does a man process so many conflicting emotions at once and not explode? Celebrate a successful first date with a girl. Learn your pastor and spiritual father had a stroke. Celebrate the first birthday of friend’s twin boys. Wake up only to find out a young friend has died in an Army training accident. To concurrently celebrate life and love while processing near death and death does something funny to your heart and psyche. How does God the Father feel and process these things on behalf of 7+ billion of His creation? There’s a serious problem with how we answer this question. Every answer we as the humans can give requires a reference point. Why? Because we are created beings. We must describe ourselves – identify ourselves – as someone who does, belongs to, is descended from, or is capable of something else. In the examples above, the reference points are employer, professional offerings, and lineage, respectively. Yet, these reference points can change just like that. One may change jobs; the market may change and render the skill sets obsolete; ancestors die, or worse, disown the children. Yahweh, the God of the Bible, is the only one that does not suffer from this problem. He is His own reference point; He is His own base case. All things were created by Him and through Him (John 1:3). The ultimate big picture is this: there is a Creator, and all else are created beings. Ask the God of I AM reveal to you the false identities you hold so that He may replace that with your true identity: a loved being created by, through, and for Him. Woke up to this text message from a friend. Wow. The Lord has blessed me tremendously with the means to be generous. Moreover, I’ve been given great faith from an early age to be a faithful tither. In fact, when I was younger and received new shoes and/or clothes from my parents, I insisted that I would first wear them to church on Sunday. Tithing – i.e., giving back to God what is His, obeying His commands – is essential for not only keeping check on your heart regarding His provisions but also for building Earthly wealth on the correct foundation. But what about spiritual wealth? Tithing [your income] is essential for building Earthly wealth. What about [tithing your time for building] spiritual wealth? Here I am lazily walking on the treadmill at my Colorado Springs hotel. I’m here for two weeks for business, and the first day has been a wash. The coordination on the military side has gotten all jacked up, so the support crew that I’m a part of has been on a holding pattern all day. Thankfully, we got to remain behind in our hotel an do whatever. For me, that means catching up on some crucial sleep! My heart is full! What an amazing weekend at the Renew & Release rally. The YWAM KC missionary team was in town to preach and train, and that means I also got to meet up w MH, EH, and SP, as well as meet JA, JN, and EY for the first time. A tremendous crew who run together for the fame of Jesus. On Friday evening, JN brought a fiery message about our identity in Christ that set the tone for the entire weekend. I may dare say that it was a real paradigm shift for me. Here I am in my early 30s and I had never received the Gospel message as I had this night. When I said YES to Jesus, there was a holy exchange that took place. My old self has been replaced by the RIGHTEOUSNESS of Christ. The implication is staggering: I am – that is, my very nature is – no longer a sinner. Yes, I have and will inevitably sin in my imperfect nature on this side of Heaven. But I am a SAINT who occasionally sins, not a sinner on an exasperating quest to obtain God’s approval! Boom. So often we as Christians are told that our sins are “a struggle against our old selves”, and we put ourselves in a box of self-condemnation if we trip up. Worse, we continue to berate ourselves, waiting out a self-imposed jail sentence to be served so God can say to us, “Aite, you’re out of the doghouse”. But this is not how it works! Jesus died, the veil was torn, He was raised and ascended to heaven, and granted us the right to approach the Throne with boldness. Something clicked in my mind that night as I realized that I tend to run from God when I sin, or worse yet when I think of the horrible things I’ve done in the past. But JN’s message – indeed the Lord’s truth – is that I am at this very moment as holy as I will ever be. The death and resurrection is the ONLY thing that makes me holy. STOP identifying myself as a sinner! I’m FREE! Christ died for me to exchange my old nature with one in His likeness. STOP treating life as if it’s sin management; make it righteousness management. Christianity is not behavior modification but living out a heart change. STOP listening to the accusation of the enemy whenever I make a mistake. Do not allow the enemy’s voice of condemnation to keep me from running to the Father. I HATE flying in the middle seat. HATE, HATE, HATE. So I was horrified when I discovered that the only remaining seat on the first leg of my trip to COS via IAH would be in a middle seat! I’ll be completely honest here. My hatred for the middle seat is absolute snobbery. I think I’m better than being squeezed between two strangers in a pressurized flying aluminum tube. It’s an inconvenience to have to ask others to move when I have to go tinkle. With all the time I’ve spent in the air as a seasoned traveller, I somehow think I’m entitled to have my choice of seating, which is always an aisle seat. So back to today. I was dreading the flight. First world problems, I know. As I approached my row, I began to get needlessly upset about the mere three hours during which I’d be subjected the MOST HORRIBLE THING EVAR. But to my surprise, when I did finally reach my row, the gentleman in the aisle seat asked me if it was ok to switch seats so he could sit next to his wife in the window seat. What an unexpected gift. Thank you. Thank you. During last night’s pre-wedding BBQ, I had a wonderful surprise when I found out that a former coworker and friend who now lives in Japan was also in Monterey for another wedding. Holla. N and I were stationed together in Korea and Maryland, where our lives of partying and exploring were occasionally punctuated with keeping a metaphorical eye on the Axis of Evil. So we met up for breakfast at Rosine’s to pig out and catch up. (I must apologize first and foremost to myself for taking a picture of the food…) Of course, a lot happens in four years – different job, location, expanded waistlines, marriage, etc. – but our old career field is a very small one, so you get to know people quite quickly. 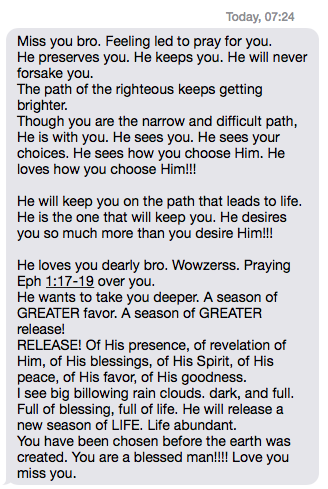 It’s always great to hear your friends are being blessed in different areas of their lives. After breakfast, I headed to the bride’s bungalow, where the families would be gathered to prep the food and supplies for the main event of the day: seafood boil on the Pacific beach. The mothers graciously paid for all the food, a serious help for the couple. What a joy seeing the mothers in the kitchen together, cutting, cooking, and forming new bonds as new family. 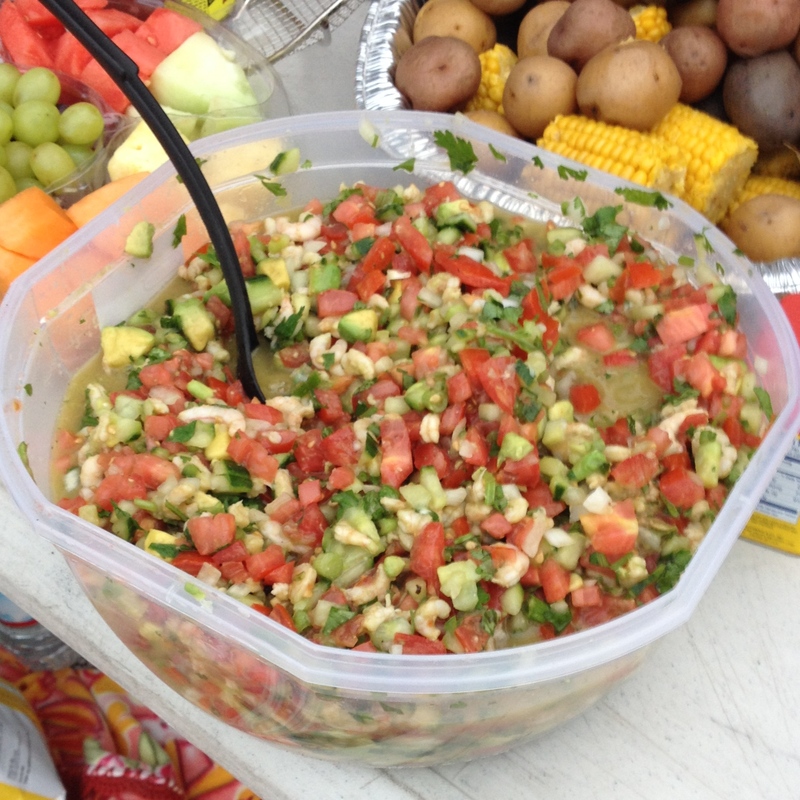 The mothers made ceviche, among other things. Me? I slept. Well, that’s not all I did. I also lounged on the enormous circular spinning Tiffany-blue sofa while watching trashy reality shows on Bravo. Bravo, never ever tune in because you’ll lose four hours of your life and four pounds of brain matter. It felt good, not doing anything while on vacation. A true vacation. The seafood boil was a success. Nested in a nook on the beach with Pebble Beach in the background, we set up a table with more delicious food than a party of two dozen could possibly hope to eat. 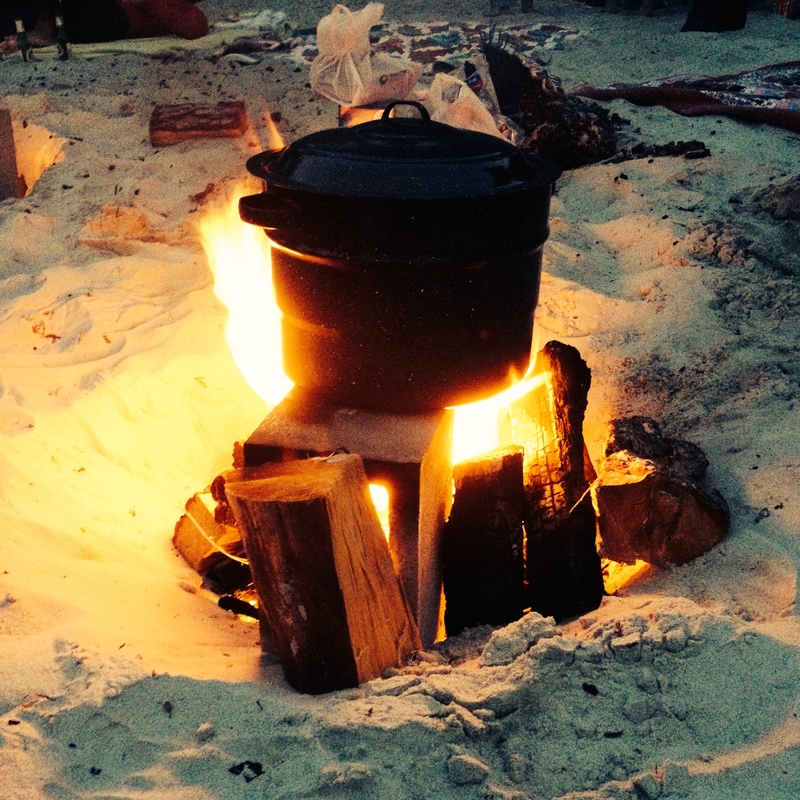 It took two tries to get the fire going for one of the two huge pots – the groom is very allergic to scallops – but after that, it was on to a night of eating, drinking, and making new friends around two bonfires by the sea. Perfect? Close. I have to say that seeing the bride’s father play with his 10 year old grandson really warmed my heart. The bride’s sister is a single mom. I don’t know what kind of father figure he’s got back home; I never really thought to ask that during our conversations. Anyway, it was something else, seesawing between tender affection and firm yet gentle corrections, delight never leaving the patriarch’s eyes as he addressed his grandson. Playful, too. I wondered if that’s how God interacts with us. Anyway, the entire family and the entire KS friend-family are very affectionate, showering each other with kisses and never-ending I-love-yous. It’s something I’ve never experienced in my own life, and I couldn’t help feel a twinge of envy even though I was also one of the objects of affection smothering. How delightful it must be to have close friends to share a deep history together.